Respiratory infections are caused by a variety of microorganisms. Poor husbandry and dirty environment can contribute to the reptile not being in healthy condition and unable to fight opportunistic infections. Of course quarantine the reptile with a respiratory infection. If your reptile exhibits these signs it can indicate a respiratory infection. *Mucus noted in the mouth and nose. *Popping, crackling, wheezing, whistling, gurgling or coughing. *Open mouthed breathing other than in the basking area. If respiratory infection is suspected a vet assessment is necessary as the reptile will need a course of antibiotic. These can be given orally, by injection or inhalation. ***Cilia are similar to minute hairs in the lungs of mammals. These cilia function in a wave action inside the lungs sweeping debris and mucus up toward the top of the lungs where mammals can cough to help move the material out. .Reptiles do not have this cilia to help move the mucus consequentially mucus from respiratory infections settle and make a respiratory infection in reptiles especially difficult . The following photos show how simple it is to provide postural position for your reptile with a respiratory infection. This positioning can help drain the mucus toward the top of the lungs. It is quite simple. You will need a surface for your reptile to sleep on, a folded towel or some other material to elevate one end, and something comfortable to lay on. This is simply a folded bath towel with the cover from a plastic shoe box elevated on one end. But you can improvise. This shows fleece to lay on. Hand towels are another good choice. Be sure to tuck the material under the elevated end. This will stop your reptile from sliding down. After the reptile is asleep it is easy to place him or her in the head downward position. This will gravity assist in draining the lungs. In the morning you may see more mucus in the mouth. This is to be expected. 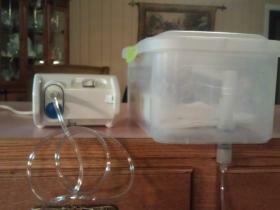 How to Make a Home Nebulizer. This can be very useful especially during RI's. Chameleon Respiratory Infections Treatment Debate, article about using Baytril in the treatment of RI in Chameleons.